Danny Haber and Elaine Brown listen during the planning commission hearing. Last night, the Oakland Planning Commission convened an unusual and highly contentious hearing about several controversial real estate projects overseen by developer Danny Haber. To some tenants and activists, Haber is the embodiment of opportunistic greed, profiting from the displacement of dozens of renters at buildings he's taken over. But Haber and his supporters say he's trying to build housing in derelict warehouses and hotels that weren't previously safe or fit for habitation. And recently, Haber announced he no longer plans to acquire and redevelop buildings with existing tenants. "What Danny Haber did to me was destroy my dream," said Joy Newhart, a former 1919 Market Street tenant who was displaced and fears she won't be able to return when her building is rebuilt in several years with a different floor plan. Haber took over the live-work warehouse shortly before it was red-tagged by the city in January 2016. His company subsequently demolished the building — and violated the scope of building permits issued by the city, causing former residents to protest. 1919 Market's substandard conditions before Haber took over, as well as the displacement of all of its residents afterward, is the subject of several lawsuits that have yet to go to trial. Peter Howe lived in another Haber-controlled property, the Hotel Travelers for seven years. Haber bought the building in 2016. "It was a good place to live," said Howe, but Haber pressured everyone to move out out. "[Haber] displaced a lot of people," he said. Another former Hotel Travelers tenant defended Haber. Dimitri Kavouras said Haber offered him a "reasonable" buyout and that he had no complaints about how the building was emptied of its residents. Kavouras now lives at the Empyrean Tower, another Oakland SRO, and said Haber helped some residents find new homes. Orlando Chavez, another former Travelers resident, was the last holdout in the building. But he left several months ago after a construction worker employed by Haber allegedly attacked him outside of his apartment. Michael Edwards, a co-owner of Lux, Inc., a nightclub that hopes to take over a ground floor restaurant space in the hotel defended Haber. He said Haber is helping him to "change a portion of the downtown that was horrendous," and afflicted with "Third-World conditions." A man who identified himself as Edwards' business partner said the hotel was previously filled with "mostly drug addicts," justifying the removal of everyone. At times, the hearing became unruly, with both side shouting at each other. Several attorneys and lobbyists also showed up to defend Haber, including Greg McConnell of the Jobs and Housing Coalition and Jill Broadhurst, the former director of the East Bay Rental Housing Association. Zachary Wasserman, an attorney with Wendel Rosen, identified himself as Haber's legal counsel. He told the commission he was worried the hearing set a precedent that allowed people with "individual motives" to pillory those they disagree with in a public forum. But later in the meeting, Planning Commission Chair Adhi Nagraj said he disagreed with Wasserman and that the hearing was precisely the kind of open discussion the city should have about controversial policy issues. Wasserman also asserted that Haber's companies paid former tenants' full relocation costs when they were displaced. "That's a lie!," some disagreeably shouted from the floor. "I know you're going to say 'boo,'" Wasserman continued, "but this is the kind of development that should be cheered." A loud boo went up in the chambers with some cheering in the background. Another detractor of Haber's business practices alleged that the developer "brought and maybe even paid people to come here," which elicited shouts of "whoa!" and "that's preposterous!" from the other side. But potential business partners who stand to benefit from Haber's projects did show up to speak. 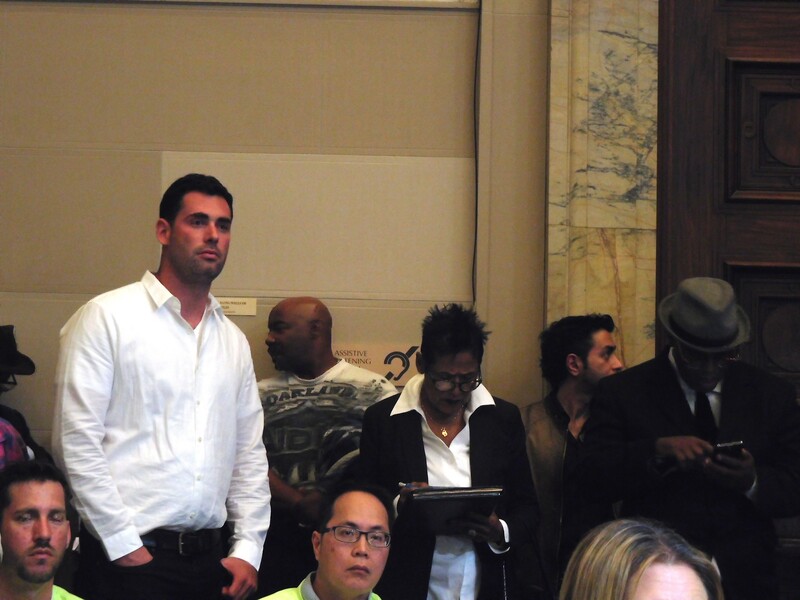 Former Black Panther-turned real estate developer Elaine Brown showed up to defend Haber and criticize the Oakland Warehouse Coalition's leader Jonah Strauss, who originally asked the planning commission to convene the hearing. Brown said Haber is building housing that will provide Black Oaklanders a decent place to live. In response to concerns about the displacement of tenants by landlords and developers Brown said, "welcome to the world of Black people, Jonah Strauss movement." She also said that her nonprofit, Oakland and the World Enterprises, is in talks with Haber to potentially lease the 1919 Market Street building once it's rebuilt and use the space to house homeless community college students. Strauss responded by saying the purpose of the hearing wasn't "about whether Haber is a good or bad guy." "It's about whether the planning commission and city can enforce its laws," he said. According to Strauss, many of the units in the buildings being redesigned by Haber, are smaller and significantly different than the units that were demolished, therefore displaced tenants will not be offered the right to return to an equivalent apartment, as Oakland law requires. Strauss' building was purchased by Haber earlier this year and plans submitted to the city show that his unit won't be rebuilt. "There's no enforcement," said Strauss about Oakland's rules regarding tenant displacement and the right to return. Darin Ranelletti, Oakland's deputy director of planning and building confirmed this, telling the commission that while city law states that tenants have the right to return to equivalent housing units if they're displaced due to code compliance issues or fires. But the city can't force a landlord to provide equivalent units if they demolish the property and rebuild it in a new configuration. The hearing was only informational. No action was taken.